Some cars have such excellent off-the-shelf exhaust kits available for them it is hard to justify going custom. Popular performance cars like the Ford Mustang, Chevy Camaro, and BMW M3 come to mind. However, for highly unusual tuning platforms, custom exhaust is your only choice. Beyond that, there are many cars with a well-established exhaust after-market where it still makes quite a bit of sense to go custom. The Hyundai Genesis Coupe is one such platform. Two weeks ago we investigated why that is the case. In summary, the off-the-shelf options available for the Genesis Coupe are all sufficiently low in quality and/or high in price to justify going the extra mile to build a custom exhaust system instead. Having done some rough math, we felt confident enough to select our major exhaust components which we were looking to buy from SpinTech. Next we needed to figure out how we would join it all together into a cohesive system. If you’re an accomplished welder with solid tools at your disposal you might be inclined to do this yourself. With a bit of trial and error a fledgling fabricator could get the job done. For most people though, us included, some expert assistance will be required. This is why, for a layman, step one in the custom exhaust build process should be to find a good fabricator. A little google-fu should be all you need to find a good partner for such a budget build. Just look for a muffler shop with a website or Facebook page that shows off custom exhaust projects they’ve done in the past. So many ordinary exhaust shops do so much boring work on regular cars that they are almost always excited to show off anything they’ve done on more interesting performance vehicles. A willingness to discuss such projects with new clients is rarely hard to find. Aluminized steel is the base-line material for modern mufflers and any exhaust shop can work with it. It’s cheap, moderately durable, and available in the form of a dizzying array of products. While this kind of build can be fun, anyone familiar with Project Hoondy knows that we take modifications of this car quite seriously. We have a preference for top-shelf engineering which means we were interested in a premium stainless steel exhaust system. Getting into stainless steel introduces a host of problems to an exhaust build. Fabricating with stainless requires specific cutting and welding equipment. If you want a custom stainless steel exhaust system you will need to find a more specialized fabricator. Look for speed shops that do major modifications, restoration work, and especially race cars. At the time we wanted to build our custom exhaust system, Project Hoondy was located in Boise, Idaho. This made the search for a fabricator a little more difficult. Boise is not a major metropolitan area and it is not a hub city for a large outlying population either. There were a few restoration shops in the area, but none of them were willing to build a one-off stainless steel exhaust system. While hard-core performance street cars aren’t common in the Boise area, local enthusiasts are rife with a love of power toys for use off-road and on water. The rugged landscape and many lakes of Idaho make an inviting environment for such machines. 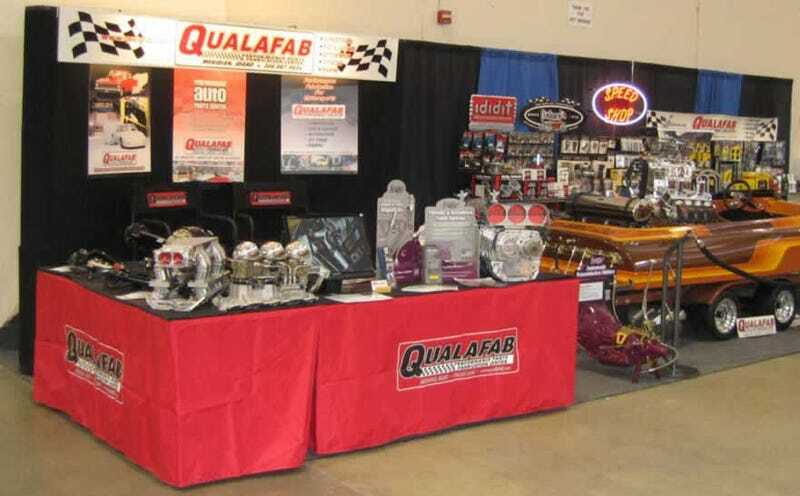 There are plenty of serious drag-racers in the state as well, combining to provide Qualafab with a steady stream of business. Owner Tim Ketlinski has turned out some real gems. Between all the off-road rigs and drag-racing machines he is vastly experienced in tube fabrication what with the need for roll-cages in abundance. He also has an appetite for major builds as evidenced by the sheer quantity of frame-off restorations he’s completed. This is the kind of portfolio you want to see when you are looking to have a high-end custom exhaust system built. It was with immense confidence that we contacted Tim about building Project Hoondy’s custom exhaust. However, he was actually slightly hesitant about the project. Guys like him are used to working with an older clientele who have serious cash to get work done on classic machines. A young guy with a budget Korean sports car is hardly representative of his bread-and-butter. It was hard not to be a tiny bit insulted by this, but we persisted and Tim quickly came to take us seriously. After having met him, it became easy for us to put ourselves in his shoes. His shop is immensely busy with a project back-log that runs months deep. We would advise anyone in a similar situation as us not to be butthurt or deterred. Tim never meant to insult us or anyone else. He and fabricators like him are just incredibly short on time day-to-day. Time is money and nobody in Tim’s position likes to waste money on some jamoke who isn’t serious. Before long we had an appointment for an initial inspection. Tim had a good look at the under-side of our Genesis Coupe and got a feel for what we wanted to do. Given our desire to use odd-ball oval-tube elbows for our exhaust tips, Tim wasn’t confident enough to draw the whole thing up on paper without being sure of our oval tube’s dimensions. He told us to purchase the elbows and he would build the rest of the system around them. We did so, and upon returning to Tim with them in hand we learned he had wanted to do things his way for a very good reason. It turned out our concept drawing wouldn’t quite work in the real world. A compromise would have to be made to bring it all together. This would lead us down a path that ended in a bizarre, but ultimately highly satisfying finished project. Tune in next week to see how the cookie crumbled here on Project Hoondy!